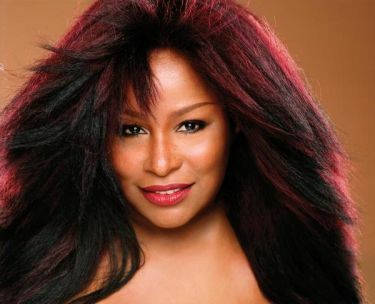 Chaka Khan was born Yvette Marie Stevens in Chicago, Illinois on March 23, 1953, eldest of Charles Stevens’ and Sandra Coleman’s five children. As a teenager growing up on Chicago’s South Side community, the presence of the Black Panther Party had an influence on Stevens. In 1967 at the age of 14, and with the encouragement of Chicago Panther leader Fred Hampton, Stevens joined the party and took the name Chaka Adunne Aduffe Hodarhi Karifi. In 1969 at the age of 16 Stevens, now called Chaka Karifi, dropped out of high school and left the Panthers to pursue a singing career. In 1970 she married Hassan Khan, but the marriage lasted only a few years. Khan was introduced to jazz at a young age by her maternal grandmother, Maude. When Khan was eleven, she and her older sister Yvonne formed their first band. While making the rounds at local Chicago music venues in 1972, 19-year-old Khan was discovered by members of the rhythm and blues band Rufus. The following year Rufus signed a recording contract with ABC Records. The band had modest success until their 1974 breakout hit, Tell Me Something Good, with Khan performing most of the vocals. Until Khan left to establish her solo career, Rufus released six platinum albums between 1974 and 1978 on which Khan was the lead singer. Khan has two children, a girl and boy. Resulting from a short relationship with Rahsaan Morris, Khan’s oldest daughter, Indira Milini, was born in 1974. In 1976 Khan married her second husband, Richard Holland, and the couple had a boy named Damien Holland. Khan and her family have been living in Europe, first settling in London, and later buying a residence in Germany. Because of her son’s problems with drugs, in December 2011 Khan won permanent custody of her granddaughter, Daija Jade Holland. In 1978 Khan released her first album as a solo artist, on the Warner Brothers label. The album entitled Chaka included I’m Every Woman, which is considered by many of her fans to be her signature song. Khan struck musical gold (platinum) again with the first single and title track of the 1984 I Feel for You album. Khan’s career has spanned decades in which she has influenced countless artists. As a result of her stellar musical career Khan has won ten GRAMMYs and was inducted into the Rock and Roll Hall of Fame on September 27, 2011. Khan has a deep commitment to women and children at risk, which led her to establish the Chaka Khan Foundation in 1999. The foundation focused primarily on public awareness campaigns around the diagnosis, intervention, available family resources and the search for a cure for autism. Her efforts were particularly aimed at communities of color and other underserved communities, where awareness about autism is low. Khan continues to tour and produce music. Chaka Khan and Tonya Bolden. Chaka! : Through the Fire (Emmaus, Pa.: Rodale, 2003); http://www.chakakhan.com/about/bio/.